There are several songs you learn in the game as well as three hidden songs that can aid you quite a bit. Below, there are descriptions of what they do and where you get them. - Playing this song will take you back to the First Day and save your game. You will lose all your 'collectable' items such as Arrows, Bombs, Deku Nuts, etc. 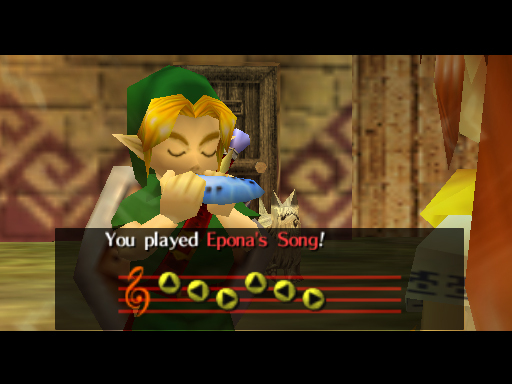 - You learn this song as soon as you get your Ocarina back. - This song has the power to heal souls and create masks. Whenever anyone mentions souls or healing, play this song. - After getting your Ocarina back, return to the Clock Tower and the Mask Salesman will teach it to you. - Play this song to blow away curses, like when the Bubbles Jinx you (can't use your sword). - You can also use it to water Magic Beans to make them grow without using Spring Water. - To get this song, go to Ikana Graveyard on the First Night and wear the Captain's Hat. Speak with one of the three Stalchildren guarding the grave and open it. - Enter the next room, kill all the bats, light the torches and enter the last room. Defeat the Iron Knuckle to earn this song. - Play this song and your horse will come to you. You can use her to jump over things and move around quickly. - Play this song for cows to fill a Bottle with Milk for free! - To get this song, practice with Romani on the First Day. 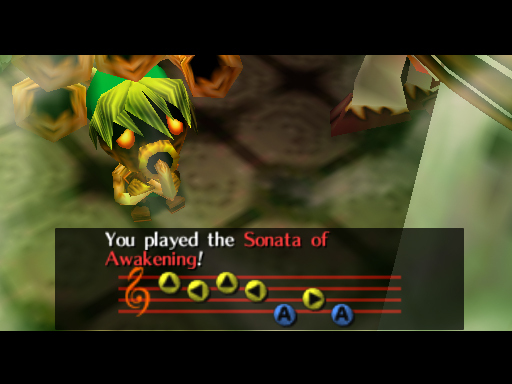 - Play this song to soar to the entrance of a dungeon or Owl Statues you have awakened thus far. 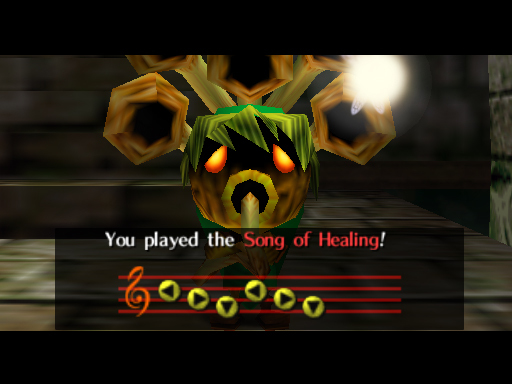 - Kaepora Gaebora will teach you this song right before you enter Woodfall. 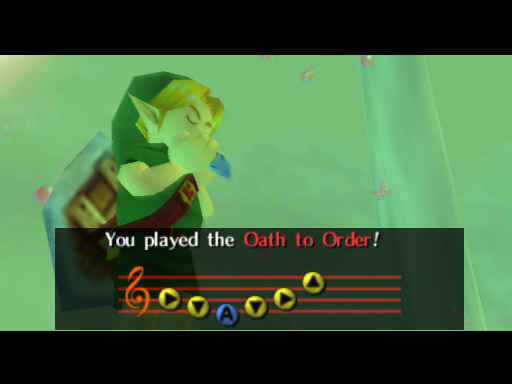 - The monkey trapped in the Deku Palace teaches you this song when you get to him. - This mystical song has the power to make your eyes heavy and fall into a deep slumber. 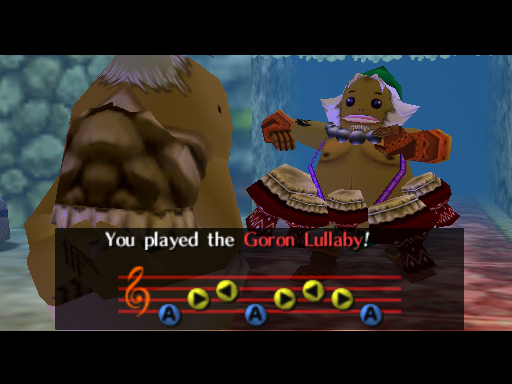 - To get this song, you have to go to the Goron Shrine and speak with the crying child while wearing the Goron Mask, then head back to the area right before Goron Village. - Smash the snow boulders in this area to find the frozen Goron Elder. Unfreeze him using Hot Spring Water and talk to him to learn the Lullaby Intro. - Return to the Shrine and play that for the baby to learn the rest. - This song really makes me feel like Nintendo got lazy. It's only use is to awaken the Island Turtle, it doesn't even restore Lulu's voice, like its supposed to. 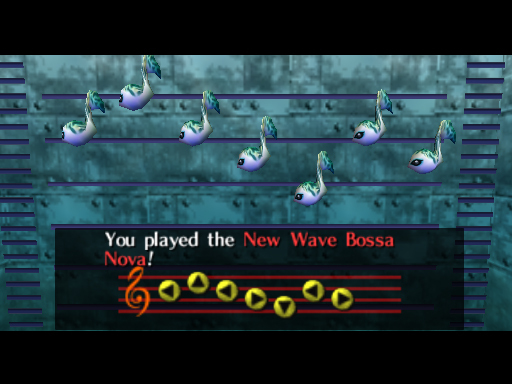 - The Zora Tadpolls will teach you this song when you place all seven Zora Eggs in the tank basin in the Marine Research Lab. - Play this song to create a statue of your current form. Using the Deku, Goron and Zora Masks, you can create up to four statues at a time. 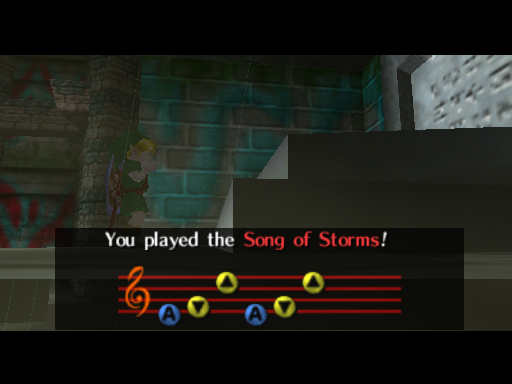 - The King of Ikana teaches you this song after you defeat him in Ikana Castle. - Use this song to call the Giants to the Clock Tower when you have freed all four of them. Woot. 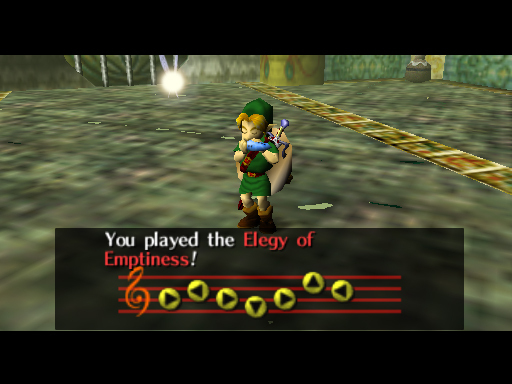 - The first Giant teaches you this song after you defeat Odolwa (Woodfall Temple boss). 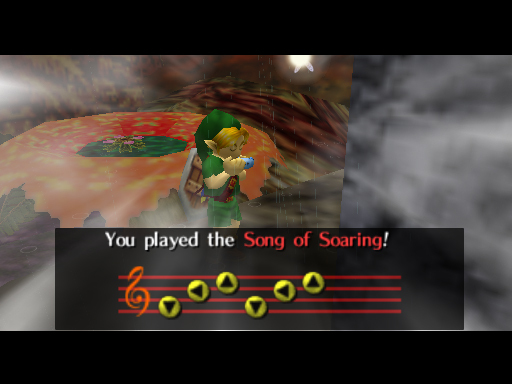 - Play each note of the Song of Time twice and you will have the option of jumping forward in time to the next 6:00 AM or 6:00 PM, just like dancing with the Scarecrow, but you can do it wherever you want instead. 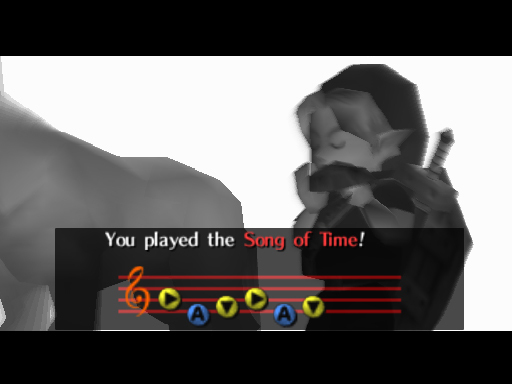 - You can use this as soon as you learn the Song of Time. 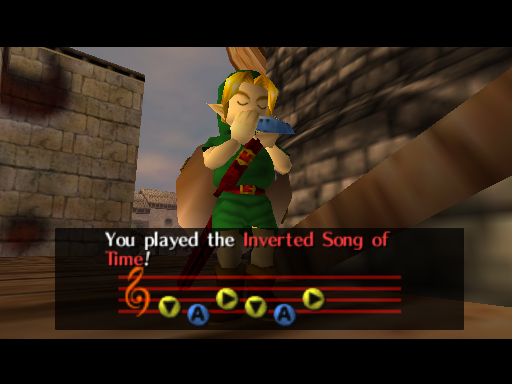 - Play the Song of Time backwards to slow time to 1/3 that of normal or speed it back up again. This is perhaps the most useful song ever. 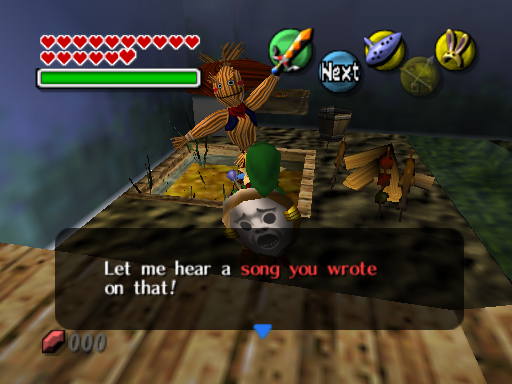 - Whip out your Ocarina in front of a Scarecrow to create the Scarecrow's Song. It must be 8 notes long. He will remember it and appear at certain places in Termina if you play it. 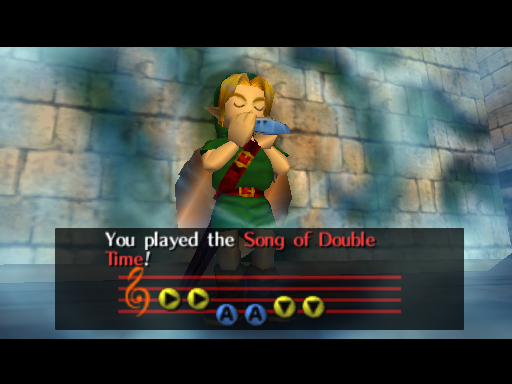 - Unfortunately, you will forget it when you play the Song of Time, so you'll have to make it all over again.